CruiseControl is a wireless remote control that works with Dock Connector iPods (including the nano). It's essentially a two-piece solution consisting of the receiver and a tiny (6x2.7x1cm) remote control. There's also a round-the-neck lanyard and small leather pouch for the remote. 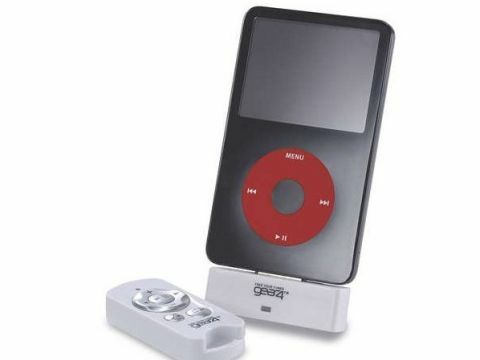 The iPod-powered receiver connects securely to the Dock Connector, while the RF remote will skip, fast forward, rewind, adjust volume, play and pause tracks. It also lets users move between sequential and randomly shuffled tracks. iPod nano users benefit from the receiver's built-in headphone socket - this is vital, because with the receiver connected, the nano's headphone socket is no longer accessible. The sound is richer through this socket than the iPod headphone socket, because it comes through the Dock Connector and uses CruiseControl's built-in amplifier. There's also a usable USB port for syncing and recharging. Gear4 claims its RF remote will operate at a range of up to 50 metres, but our tests don't confirm this, indicating its range is limited to 10 metres. At longer distances, commands behave inconsistently, if at all. This limited range shouldn't matter too much, though, because CruiseControl is unlikely to be used at such distances. There are better remotely controlled docks available that integrate iPods with existing home entertainment systems. However, this is most likely to be used by security-conscious commuters seeking discreet wireless control of their music, who want to avoid letting others know they're using an Apple music player. It may also be useful to drivers who connect their iPod to their car stereo using a cassette adaptor.